This article is about a digital marketing concept that a simple two-word phrase captures: “Cannabis SEO”. But it applies to other industries, too, from wine to whiskey to financial services. Even cryptocurrencies. Anything that is regulated or even prohibited. And it’s one more piece of evidence that SEO is still the least exploited form of word-of-mouth marketing. The Cannabis SEO Principle is a pretty basic supply-and-demand concept. The more limited your advertising and marketing options, in terms of channels available to you, the more valuable SEO (Search Engine Optimization) strategies become. That’s because SEO is perhaps the least regulated major marketing channel in existence. It’s not for lack of will, on the part of search engines, that is SEO unregulated. Microsoft and Alphabet, which own the three biggest search engines (Bing, Google, and YouTube), love to regulate things. Like ads on Bing, Google, and YouTube. SEO is a de facto unregulated marketing channel. That’s because the search engine business model (automate the aggregation of ad inventory against which to run automated ad auctions) doesn’t allow for manual curation. That’s why Google fought so hard to deny European citizens the “right to be forgotten” in its search index. Ensuring that right makes a tiny dent in Google multi-billion dollar, ad-revenue profits, but it strikes at the core of the search engine business model: automation. The Cannabis SEO Principle: the more regulated paid ads are, the more value in SEO. As I’ll discuss later, in fact, getting your cryptocurrency business into Google search results is the online marketing gold standard, pun intended. If the ability to purchase your prospective customers’ attention is limited by regulations, such as those that Google applies to paid advertisements, then the Cannabis SEO Principle applies. By the way, I’m not calling it the “marijuana SEO” principle because the term “cannabis” has become the preferred nomenclature in the marijuana business. Err, I mean the cannabis business. But what I mean by cannabis is legalized marijuana sold for both recreational and medicinal purposes. I worked with a SaaS client earlier this year, a “cannabis startup” sponsored by Canopy Boulder, a startup incubator and investment fund. This startup’s entire business model was predicated on one odd truth: the majority of cannabis purchases are influenced by “budtenders”. (Budtenders are the retail staff who sell marijuana leaf, edibles, and products at dispensaries). As a matter of fact, law and custom dictate that marijuana is always handed to the customer by a budtender. Just like shopping for leather gloves in 1890’s London department stores (and it’s still that way in some of the more traditional European locales). You can’t handle the merchandise yourself. You have to ask to see it and you have to also discuss it with the person who hands it to you. The startup’s software products help these influencers, the budtenders, manage inventory (for “free”), using a software product custom designed to manage the large and complex inventory typical to a marijuana dispensary. In exchange for use of this free software, cannabis brands get to do budtender-targeted marketing, within the product itself, in the hopes of boosting in-store sales. (ProTip for cannabis brands: develop a “budtender-focused” sales and marketing strategy). So if cannabis brands can’t pay to reach the customers, they can at least pay to reach the people most likely to influence those customers’ point-of-sale decisions. In other words, cannabis businesses are twisting themselves into knots to reach their customers in creative ways. But here’s the thing: SEO has far greater reach. According to search data aggregator SEMRush, the search “types of marijuana” and the cluster of searches with the same intent, collectively account for 410,000 Google searches per month. 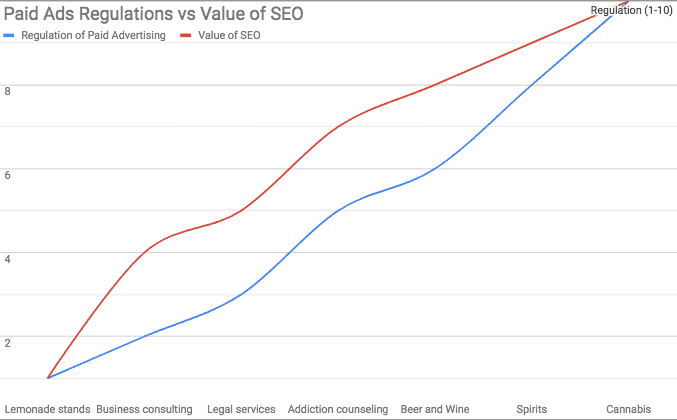 Why Cannabis SEO Principle and not, say, Wine and Spirits? At this point, you might be asking why I am picking on cannabis and not wine, beer, or other semi-contraband, controlled product types? Searches like best craft beer or cryptocurrency investments also yield enormous search volume. 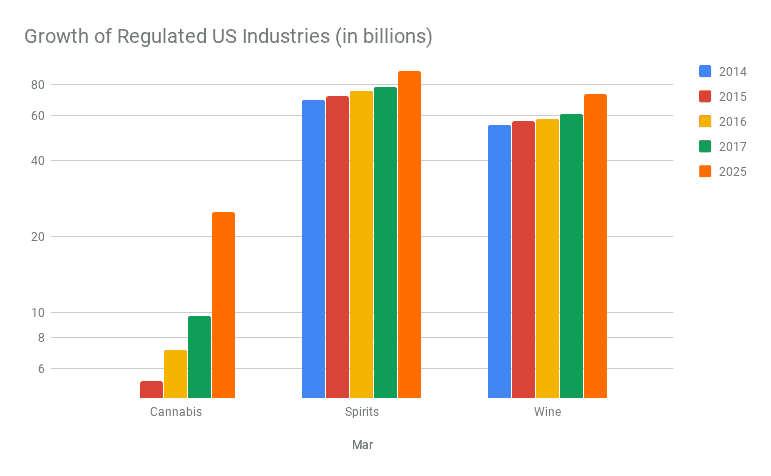 Here’s why – the cannabis market is not only enormous, it’s growing exponentially, with no let-up on paid advertising prohibitions on the horizon..
As you can see from the logarithmic bar chart above, in the coming seven years the cannabis industry is predicted to grow much more rapidly than its counterparts, the wine and distilled spirits industries. Soon for every two dollars spent on wine in the United States, 1 dollar will be spent on cannabis – legally. Even the beer industry, with 111 billion in US sales in 2017, recognizes the skyrocketing market demand for cannabis products. 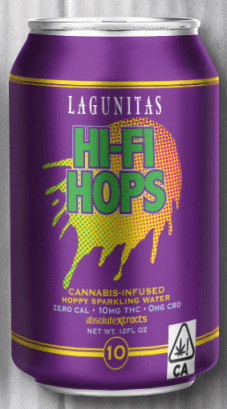 In June of 2018, one of Heineken’s “craft” brands, Lagunitas, launched a “marijuana beer” line, cleverly named Hi-Fi Hops, in what is sure to be the first of many forays by the alcoholic beverage industries into the cannabis market. That’s not surprising when the overall beer market is stagnating, especially among non-craft brands, which are growing like their counterparts in distilled spirits and wine. In fact, US (global) demand wine and distilled spirits are extremely healthy, you might say. But in terms of growth velocity, theirs is modest compared to cannabis, which is projected to grow 600% between 2015 and 2025. Cannabis is experiencing the kind of growth we associate with the cryptocurrency market, where the top 1600 or so digital currencies have a July 2018 market cap of 264 billion, up from 0 in 2008. 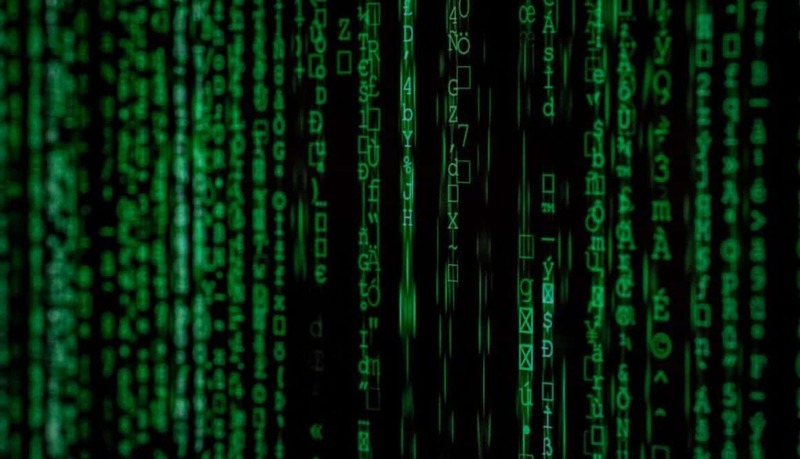 In fact, the Cannabis SEO Principle could also be called the “Crypto SEO” Principle (or ICO SEO), but there’s a huge difference – up until Q1 and Q2 of 2018, paid advertising of digital currencies and services was permitted. And it may be permitted on a limited basis if the industry – or part of it – adopts regulations. Paid advertising has never been allowed for cannabis, and the growth from 9.7 billion to 25 billion over the next 6 years will have to happen without it, too. That’s why it’s the Cannabis SEO Principle; there is no market growing so fast and so big that is as constrained by paid advertising. It goes without saying that if it’s restricted in digital advertising, it’s probably restricted in traditional mediums, quaintly referred to by advertising agencies as “broadcast, print, and outdoors”. The landing pages I wrote were optimized for demographic profiles that could be segmented on the Facebook Ads platform. Which was to supply 100% of the traffic. That was in March. Then boom. The hammer dropped. In April and Facebook shut down all crypto-related advertising. But the industry has continued to struggle, no longer able to rely on the cash machine that was search and social media advertising for selling crypto-related services and investment opportunities. In terms of marketing strategies, you’d think that the answer to limits on paid advertising lies in social media. To some extent, it does. But social media platforms like Facebook and Instagram routinely shut down business accounts that are connected to the Cannabis industry, in particular. “Shut down” meaning user accounts either deactivated or deleted, as DOPE magazine contributor and social media consultant Amy Donohue points out. The other major online advertising business besides search – social media – also regulates content heavily. Not only in paid ads but to an extent user-generated content. I suppose if you’re in the cannabis industry, the principle of avoiding digital sharecropping becomes an even more important consideration when creating content. So: social media is not the answer for your cannabis brand, dispensary, pipe, vape pen, dog food, or medicine. Or at least it’s not the primary answer. The primary answer is, as Seth Godin tells us, your own platform, your own CMS-powered website (Seth recently migrated from Typepad to WordPress, hence the discussion on his podcast). I write to you from California, where marijuana became fully legal 6 months ago. Because it has long been quasi-legal under medical marijuana laws, it already has a strong customer base. So strong, in fact, that the legalization of marijuana in California is expected to almost double the size of the US cannabis market, adding up to 4 billion in 2018 revenue to the 9.7 billion sold in the US during 2017. Meanwhile, the legalization of marijuana in Canada will add 4.5 billion, nearly doubling the total North American market size in 1 year. The investment community is starting to take notice. I see this in my work on an almost daily basis since I monitor the demand for marketing services on the LinkedIn Pro and Upwork contract marketplaces. What’s notable about this totally unscientific list is that much of that money invested in startup ventures end up going to paid advertising (tech startups: one of Google’s most loyal customer bases). But not for the top two categories: cannabis and CBD. By the way, CBD is a little more complex; it is an industry unto itself apart from Cannabis, and to the extent that it is derived from hemp, not marijuana, it isn’t entirely prohibited by the digital advertising industry. Billions in collective assets and nowhere to buy ads. And I’ve seen demand for SEO too, but not nearly enough because there are still countless SEO opportunities waiting to be seized. Case in point: headaches. There are 38 billion people in the United States who suffer from migraines. And 10 million suffer from chronic migraines. Meanwhile, study after citable study, including studies published by the NIH, demonstrate what many people already know: cannabis is an extremely effective migraine treatment. So what shows up in the search results for search terms like “marijuana for migraines”? With the possible exception of the Web MD article, none of this content adds value for anyone but the most casual, curious web searcher. Not one of the 10 links on the first page provides any guidance on how and where to acquire migraine relief with marijuana. This represents a strategic opportunity. 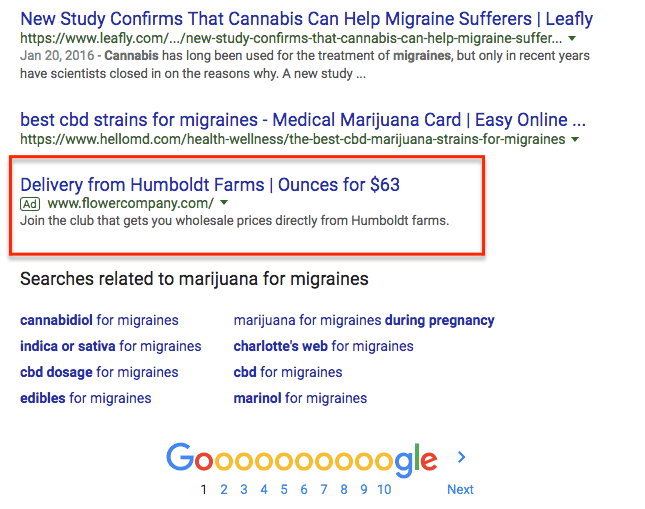 Get a $63 ounce from Humboldt – and get migraine relief! That is the message – a fusion of conversion copywriting and SERPs (search engine result pages) optimization – that Cannabis SEO can deliver to its enormous audience. And they don’t even have to say it without using the word Cannabis (or CBD, or CBD oils, or marijuana). The case I’ve made in this article is that the Cannabis SEO Principle applies when the advertising industry, especially the Google-Facebook duopoly, prohibits you from buying digital advertisements and promotions. 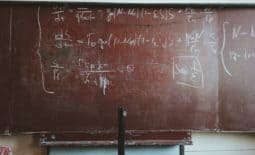 But another reason I wrote this article is to get my readers to think more about SEO as a part of their marketing strategy. 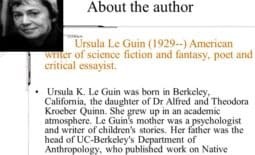 Consider the following. Then there’s the central consideration: what problems are people from your audience not finding solutions to using search engines?